Hot action in the North Pole ! "Dr. Buc Ooze first came to the world's attention many years ago. His controversial research into animal shaping had gone too far, transforming creatures into unnatural forms (or - reducing animals to a fraction of their former size). Over the years, Ooze grew careless, and the misshapen menagerie he discarded drew attention to his evil plot. Work began on the ZooCube - a machine specifically designed to reverse Ooze's scientific process and restore the animals to their natural state. When the mutated creatures enter the ZooCube behind another of their kind, the shaping effects are neutralized and the animals return to normal. Your mission: rescue the animals transformed by the Doctor's hideous experiments. 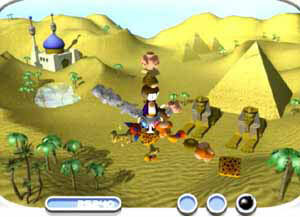 Use the ZooCube to collect them from around the globe and make them whole again. Good luck with your mission - the future of the natural world is relying on you!" 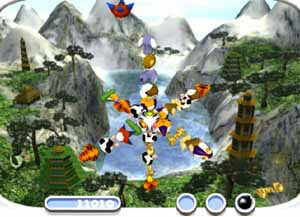 "ZooCube is a new, advanced puzzle game filled with fast-paced, reflex action. Simple to learn, but tricky to master, ZooCube brings frantic, heart-racing action to the Nintendo GameCube and Game Boy Advance. Think outside the cube and put your puzzle-solving skills to the test. 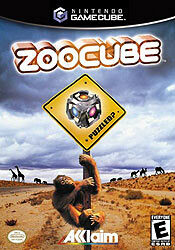 ZooCube takes puzzlers to a new level . . . the third dimension. 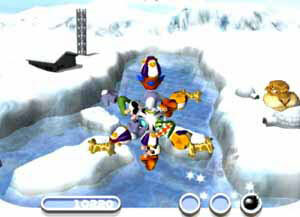 - The only 3D puzzle game available on the Nintendo GameCube. - Addictive, engaging, intoxicating, heart-racing puzzle action. - Intense 3D puzzle action. No two puzzles are the same. - Special power-ups, bonuses and mind-bending three-axis rotation. 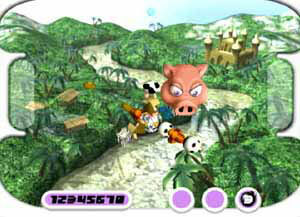 - Play cooperatively with a friend or in head-to-head battle. - 12 different modes with over 100 hours of gameplay."